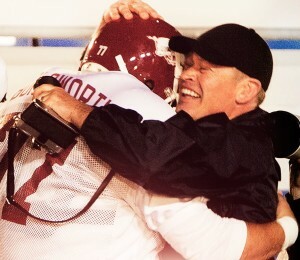 We could not be more excited about the upcoming release of the movie ‘Greater’, the Brandon Burlsworth Story. In case you are not familiar, the movie is about the story of Brandon Burlsworth, possibly the greatest walk-on in the history of college football. The movie was directed by David Hunt and written by Brian Reindl & David Hunt. If I’m not mistaken, I think Neal McDonough also had a hand in production (might be wrong). As some of you might remember, Spencer played “Baby Aaron Burlsworth” in the movie (he actually got to meet the real Aaron the other day). The movie is not some low-end production either, while we were on set w/ Spencer for filming we got to hang out with Neal McDonough (Captain America, Star Trek, Desperate Housewives, etc. ), Leslie Easterbrook (police academy, Baywatch), Wayne Duvall (oh brother where art though), and the list goes on. You might even recognize Quinton Aaron from the movie ‘Blindside’ as one of the coaches in ‘Greater’, also M.C. Gainey, who played Roscoe in the movie ‘Dukes of Hazard’ is one of the coaches –the list goes on. The role of Brandon is played by Christopher Severio, a super nice kid that Spencer really enjoyed hanging out with during filming.